Cloud-Based Customer Service and Customer Experience. Verint® Systems Inc. announced its acquisition of Contact Solutions, a leading provider of real-time, contextual customer care solutions. The combination of Contact Solutions advances the Verint Customer Engagement Optimization™ portfolio with the addition of cloud-based solutions that enhance voice and mobile self-service through automation and analytics-driven personalization. By joining Contact Solutions’ strong self-service capabilities with its advanced customer analytics, engagement management and workforce optimization solutions, Verint is extending omnichannel engagement across the enterprise. With this acquisition, Verint is furthering its mission of being the world’s leading Actionable Intelligence® platform that enables organizations toprovide crucial insights that empower decision makers to anticipate, respond and take action. Cloud-base Voice and Mobile Self-Service. The combination of Contact Solutions and Verint will increase the value proposition that customers of both companies receive. Verint customers will be able to extend their investments in omnichannel customer engagement with expanded cloud-based voice and mobile self-service options. Contact Solutions’ dynamic customer base—including many public sector and commercial organizations—will have access to new world-class actionable intelligence with the ability to leverage leading customer engagement optimization solutions to help transform their end-to-end customer engagement. Personalization Engine: Providing Intelligent One to One Service. Today’s forward-thinking organizations understand the value of delivering personalized and contextually relevant interactions that enhance the customer experience and heighten loyalty. Backed by a robust set of analytics, Contact Solutions’ personalization engine analyzes and adapts call flow and the pace of interactions based on caller behavior. For example, if a caller most frequently selects “account balance” from a set of menu options, the personalization engine can detect this behavior and dynamically rearrange the menu so “account balance” is always the first option presented to that caller. This reduces both time and effort, resulting in better experiences for customers, and decreasing interaction costs for the enterprise through higher automation rates and shorter calls. Cloud-based Solutions Extends Engagement Optimization Across Smartphones, Tablets and Personal Computers. The rise of “digital-first” approaches to customer engagement has opened the door for consumer engagement at any point in the customer journey. Thanks to the widespread adoption of smartphones, mobile self-service is on the rise and growing in popularity. To address customer demand and market dynamics, Contact Solutions delivers My:Time™ (its patented digital engagement platform.) This cloud-based solution extends engagement optimization across smartphones, tablets and personal computers. With advanced, cross-channel messaging functionality, it enables customers to start a digital interaction on one device and continue it on another, allowing continuity and continued personalization of interactions. Leveraging My:Time’s App2Agent™ functionality takes mobile customer service another step forward by enabling a seamless transition from self-service to live service within a mobile app, mobile web or web application. This will advancing mobile self-service and engagement. Privacy and Security: Combating Contact Center Fraud. The combination with Contact Solutions also will add functionality to Verint’s solution set focused on mitigating risk, identifying fraud and reducing loss. For instance, Contact Solutions’ capabilities complement Verint Identity Authentication and Fraud Detection™, the innovative technology that delivers passive voice biometrics to profile and recognize the voiceprints of fraudulent callers—while makingcaller authentication faster, easier and more secure. Backed by advanced analytics, Contact Solutions brings advanced “upstream fraud detection” functionality that can identify suspicious caller behavior within voice self-service interactions. As potentially threatening interactions surface, red flag detection alerts users to problems and tailors appropriate responses. MY POV: Businesses need to decide the evolution into the cloud, especially when it comes to customer engagement, customer service and especially mobile and self-service. As customers become more and more attached to their phone, and their expectations for customer engagement higher than ever, it’s really time businesses decide on their digital transformation strategy and start now. Tomorrow is too late! Verint System, Inc and Selligent announced a major new release of its Telligent Community™solution. Among the latest advancements to the Telligent Community are the new community management tools and user experience capabilities, workflow enhancements, new content management and moderation functionality, and ongoing API investments, as well as solution availability in a Community as a Service (CaaS) model. These advancements are designed to further organizations’ use of actionable intelligence that flows through their communities as they focus on the advancement of strategic objectives, such as gaining a holistic view of customer service effectiveness, integrating social experiences on the web and supporting digital transformation initiatives. The Telligent Community social software platform— which is available in SaaS, on-premises and now CaaS deployment models—enables customer service and digital marketing organizations within a business to create compelling, online, branded communities for customers, partners and employees to collaborate and engage. This new release marks the first community product introduction to follow the acquisition of Telligent by Verint in 2015. Community Management Advancements for Increased Efficiency: The suite of Telligent applications and services features advanced management capabilities designed to reduce the time and resources required to manage the community. Among these are new moderation functionality, updates to leaderboards, search engine optimization (SEO) updates, new content management tools, and enhancements to question and answer (Q&A) workflow for customer support use cases. All of these enhancements are designed to free the community owner to spend more time with customers. Staging and Publishing Workflow Enhancements to Simplify Deployments: New workflow capabilities in the Telligent solution enable users to stage and preview changes and updates to the community prior to rolling them out into live user environments. For Telligent customers upgrading from previous versions or upgrading widgets, these staging and publishing enhancements can save valuable time and effort, and simply workflow and deployment. Addition of Intelligent Content Management and Moderation Capabilities: Also new to the Telligent Community is the introduction of analytics, user reputation and abuse reporting to enhance and simplify workflow associated with moderating content and users. These expanded moderation capabilities provide services across all content published within the community and add a process that enables content authors to appeal when content is incorrectly moderated. This represents yet another advancement designed to ease the workload of the community manager. New Community as a Service Offering: In addition, the Telligent solution is now available in a Community as a Service (CaaS) model. By using CaaS, organizations can benefit from the full suite of applications, services and management tools offered by Telligent Community. The CaaS offering is a Telligent managed service solution that enables customers and partners, and their developers, to build the unique, creative community experiences they desire. Ongoing Investment in the API Economy: For developers, the solution features a host of advancements, including moving many of Telligent Community’s integrations to open source on GitHub. It also has new editors for managing content, as well as editors for managing all design elements, such as CSS. Further enhancements involve expanded APIs, WebHooks and application tracing, all designed to simplify development efforts for customers and partners that want to build on the Telligent platform. The solution also includes updates to its widget studio functionality for managing the full user experience. Customer communities serve as a natural extension to customer engagement optimization, and Verint offers communities as part of a comprehensive platform with ties to engagement management, customer analytics and workforce optimization. Using the Telligent solutions, organizations can uniquely provide actionable intelligence across customers’ omnichannel experiences to include voice, chat, email, web self-service, and customer and employee communities. Leveraging community software, companies can foster customer-to-customer and employee-to-employee collaboration and trust, support and drive enhanced self-service and social support, lower service costs, and enable destinations for dynamic digital marketing campaigns, while fostering new levels of customer and employee engagement. As communities become more and more important to companies, as the research in my paper has shown, it’s important to a businesses strategy to include a community. You can download an excerpt and learn more about my research findings on the business value to communities, that goes far beyond just Customer Service. As you might recall, Telligent®, acquired Zimbra, whose purpose was to help organizations enhance support, drive digital transformation and to ensure brand consistency. Today, Verint acquired Telligent®. The reason for the acquisition? Verint wants to extended its customer engagement optimization portfolio with the addition of a market-leading, enterprise-class community solution. As a result, organizations can uniquely provide actionable intelligence across customers’ omnichannel experiences to include voice, chat, email, web self-service, and now customer and employee communities. Was This Acquisition a Good Move For Verint? MY POV: This seems like a very good move for Verint, as having a community offering is key to customer care. Communities are a critical part of customer service as well as customer engagement. With the combination of Verint and Telligent, customers will be uniquely positioned to use the actionable intelligence that flows through their communities to help achieve important strategic objectives, including the ability to gain a holistic view of customer service effectiveness, integrate social experiences on the web and support digital transformation initiatives. How Is Having An Option for Online Communities Useful To Brands? By integrating communities into their customer support and marketing strategies, organizations can lower their service costs, redirecting routine customer queries to their communities for quick answers to frequently asked questions. Through powerful analytics, they also can gain critical insights into buying trends and patterns; evaluate marketing content and campaign effectiveness; enhance social selling; take action on voice of the customer feedback about products, services and overall experiences; and heighten loyalty. How Do Communities Play a Role In OmniChannel Customer Engagement? As consumers continue to self-serve and seek insights and perspectives from peers, the importance of social communities has grown. With increasing demand for more real-time engagement and personalized service, communities are becoming sought-after and valued sources for customer support. Likewise, marketers are turning to social communities to infuse new digital content, advance social experiences in their online properties, and take action by tracking and analyzing buyer behavior and site activity. There’s not one department that can’t benefit from an online community. And, while that is true, not all departments know the business case. There are huge business reasons for every single department – customer facing or employee facing – that can benefit from an online community. Does Your Brand Have a Community? If not why? What are you waiting for? 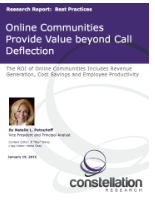 Want the ROI of online communities beyond customer service? I’m your ROI gal! Don’t forget to submit your case study to the Super Nova Awards!!!! NOW! !